Honey, I found Isolated Dwarfs! Authors: S. Stierwalt, S. E. Liss et al. … I mean, the authors of today’s paper did. The current favourite model for the evolution of the universe, the Lambda Cold Dark Matter (LCDM) model, supports growth of cosmological structure via consolidation of smaller units. Widely referred to as ‘hierarchical’ assembly, this prescription posits that dark matter haloes as small as the size of our solar system act as the first seedlings that gradually grow up to be galaxies, galaxy groups and galaxy clusters. As a natural consequence of this picture, cosmological simulations predict a huge extant population of satellite structures surrounding the present-day structure at all scales that survived during the latter’s build-up process. So, where are these satellites; have we seen them? The answer, as it turns out, is yes and no. Observations have clearly elucidated that big galaxies such as our own Milky Way have several satellite- (or ‘dwarf’) galaxies surrounding them, as well as remnants of their destroyed building blocks in the form of stellar steams. On the other hand, despite predictions from theory and simulations, no satellites have been observed around the dwarfs themselves, nor have any dwarf galaxies been observed far away from big galaxies. Naturally, this has posed to be a discouraging evidence against the hierarchical buildup at small scales so far. At the beginning of this year, Sabrina Stierwalt and her collaborators brought water to the thirsty by publishing the long-sought evidence of hierarchical structure formation at the low mass scale. In their paper, the authors reported direct observations of seven isolated, compact galaxy groups comprised solely of dwarf galaxies (see Figure 1). The discovery of these groups was made during a visual inspection of the most isolated dwarf galaxy pairs in the TiNy Titans survey (TNT), a multi-wavelength observational campaign that aims to investigate the effect of dwarf–dwarf interactions on the evolution of low-mass galaxies. Figure 1. A three-color composite image of one of the observed groups, where red objects depict the individual member dwarf galaxies. Even though they say seeing is believing, in astronomy, seeing something alone is rarely enough. In order to establish the identity of the objects the authors had seen as dwarf galaxy groups, they performed follow-up spectroscopy to confirm the association of the candidate dwarf galaxies with the visual groups in their images. Using the information about the groups’ projected sizes and velocity dispersions (see Figure 2), combined with the knowledge of typical dark matter content for dwarf galaxies, the authors performed dynamical mass calculations, the results of which imply that the observed associations are likely gravitationally bound structures. Figure 2. 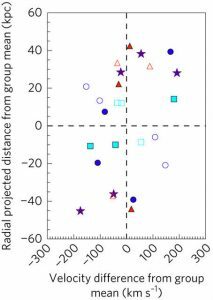 Projected radial distance from the centroid of the group vs. difference in group member line-of-sight velocity from the group mean. The seven different symbols represent dwarfs belonging to the seven groups detected by the authors. This isn’t the first time that associations of dwarf galaxies have come into the limelight. Previously made observations of the Milky Way dwarfs and their apparent proximity to the orbital plane of the the Large Magellanic Cloud have been argued to suggest that those dwarfs could be the result of a tidal breakup of the Magellanic group, of which the Magellanic Clouds were the largest (and brightest) members. Nonetheless, what makes the dwarf groups described by today’s authors in their paper truly unique relative to any previously known associations is their virtue of being highly compact and isolated. Being about an order of magnitude less extended than previous groups, and more than five million light years away from any massive neighbor, the TNT groups have the potential to serve as ideal labs for the study of structure build-up at small scales, unaffected by sensitive environmental effects such as ram pressure or tidal stripping that can otherwise erase the dynamical signatures of historically existing coherent structure. The discovery of TNT dwarf groups provides a promising opportunity for the study of hierarchical assembly at low mass scales. However, mis-judgement of information sprouting up due to the completeness effect, and a bias towards detection of bright galaxies are possible in this study. 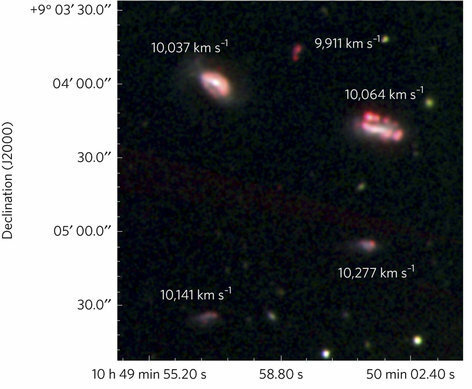 Given that the brightest members of the reported groups are rather large, this study keeps the story of hierarchical formation at typical dwarf and satellite galaxy masses (i.e., very low mass-scales) yet a mystery. Future observations of even fainter galaxies and substructure in these groups will boost the census of dwarf galaxies to a statistically significant level, providing stronger grounds to tune our understanding of how structure forms in this elusive universe of ours.